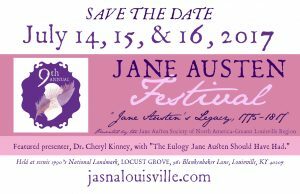 The Jane Austen Society of North America- Greater Louisville Region is already hard at work on the 9th Annual Jane Austen Festival, which will be held at 1790’s Locust Grove in Louisville, Kentucky. 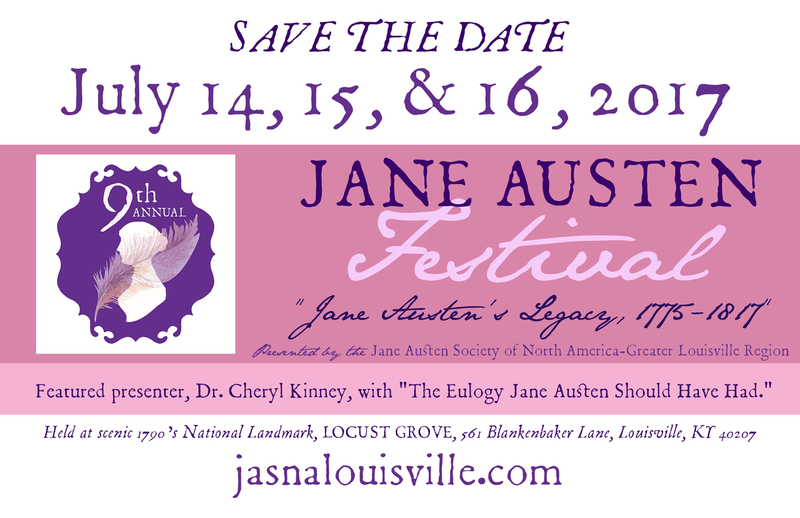 This year, we will be celebrating “Jane Austen’s Legacy, 1775-1817,” and commemorating 200 years since her passing. Join us on Friday, July 14th, Saturday, July 15th, and Sunday, July 16th! On Friday, July 14th, the hours are 6-9 p.m. and we will have two special people in attendance: Emperor Napoleon and Admiral Lord Nelson! What will they say to each other? Watch our website for more details and scheduling. How fortunate that July 14th is Bastille Day! Come dressed in your Costume Parisienne finery and enjoy foods from a food truck that makes crepes! All of our Vendor shoppes will be open for business for Twilight Shopping- come for early deals! On Saturday & Sunday, July 15th & 16th, the hours are 10 a.m.-5 p.m. each day. 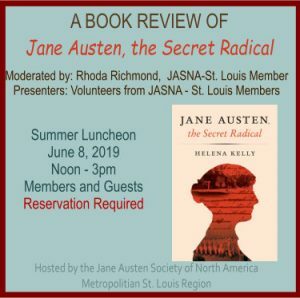 Our featured speaker is Dr. Cheryl Kinney and she will be presenting, “The Eulogy Jane Austen Should Have Had.” We will also have the ever popular Regency Style Show by Betsy Bashore, the Regency Fashion Display by Gayle Simmons, and a NEW Punch & Judy Show. 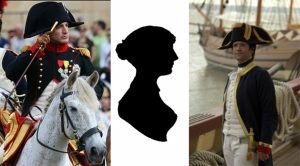 The Acasta Naval Encampment will be back and more! The Vendor shoppes will be open for business each day. We will have food available for purchase at the Earl of Sandwich Shoppe, which will be in a new location this year. Plus our Four-Course Afternoon Tea sittings with a special Children’s Tea on Sunday afternoon! Our 2017 Workshops include making Tussie Mussies, String your own strand of Pearls, Regency Letter Writing, and Netting. The Grand Ball will be on Saturday, July 15th, 7:30-10:30 p.m. at Spalding University. 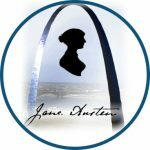 On Saturday, July 15th, we will have a Regency Mourning Procession in honor of the 200th anniversary of Jane Austen’s passing. More details on proper female and male dress to come later. 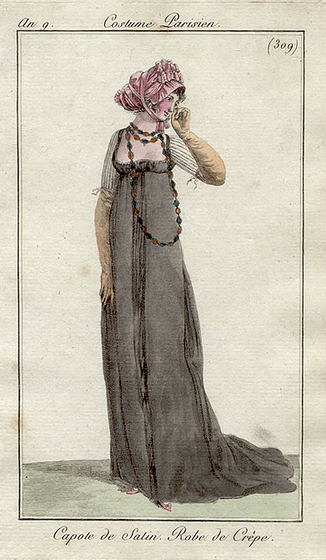 In the meantime, check out this Pinterest Board on Mourning Attire. Need a place to stay? Go to our website for information about hotels, B&B’s and more. There is a huge music festival the same weekend, we suggest making reservationssooner rather than later. as they sell-out before the festival opens. Festival Admission is $6 per person for Friday Night-Twilight Shopping and $12 per person for one-day admission on Saturday or Sunday. Children under 12 admitted free with an adult. NOTE: A two-day admission pass for $20 per person will be available ONLINE ONLY. The Four-Course Afternoon Tea is $25 (plus Festival admission) per person and Children’s Tea is $20 per child (plus Festival admission if over 12 years of age). The Grand Ball is $25 per person. Workshop prices will be available April 2017. We hope to see you at Locust Grove this July! Tagged costumes, fashion, gatherings, Jane Austen, Louisville Jane Austen Festival. Bookmark the permalink.